danger to Connecticut’s $30 million shellfish business, according to field research conducted by Carmela Cuomo, head of the marine biology program at the University of New Haven, and several of her students. The migration of the non-native pest, sometimes called an Asian clubbed tunicate, southward from Canada and northern New England threatens farming of bivalves such as clams, mussels, scallops and oysters in Long Island Sound. Styela clava’s efficient feeding, rapid reproduction and tendency to form large colonies enable them to crowd out other species. Connecticut’s shellfish industry provides 300 jobs statewide, generates $30 million in sales and has 70,000 acres of shellfish farms in the state, according to the Connecticut Department of Agriculture. The state, world famous for its oyster industry in the 1800s, has been working since the 1960s to rebuild its shellfish beds and clean up the pollution that led to the industry’s demise. Connecticut shellfish beds produce oysters, mussels and scallops as well as Quahog, steamer, razor and other clams. Styela clava is an invertebrate that can travel great distances by attaching themselves to the hulls of ocean-going vessels. In fact, the styela here are believed to have originated in waters off the coast of Korea and were first documented in British waters in 1953, after that nation’s warships returned from service in the Korean conflict. Styela has been reported in waters off Canada, and beginning several years ago were spotted in Fisher’s Island Sound near Groton, Conn. and in Noank, Conn. It was later discovered in Atlantic waters near the eastern mouth of Long Island Sound. Only recently has the species been observed within the Sound itself where the water is warmer than in Fisher’s Island Sound. However, Styela’s preference for cooler water—between 35 and 73 degrees Fahrenheit—made it seem unlikely it would travel much further south. A UNH graduate student, Melody Wood, working in Cuomo’s lab, has documented survival of adult Styela in waters as warm as 86 degrees F. In addition, Nicholas Brunetti of Saddle Brook, N.J., an undergraduate also working in Cuomo’s lab, has been investigating whether or not adult Styela clava can reproduce at higher temperatures, along with whether or not their larvae can survive at such temperatures. Another undergraduate, Samantha Davidson of Groton, Conn., has been studying the communities of organisms found growing on Styela. Additionally, Wil Dixon, a graduate of Amity Regional High School in Woodbridge, Conn., spent several years working in Cuomo’s lab on the effects of temperature on Styela’s filtering rate. He won several awards at science fairs for his work and is now a freshman at the University of Michigan. Similar to other sea squirts, Styela consumes plankton by filtering seawater through a bronchial sac inside its body cavity. These animals are called “squirts” because they pump and expel the water they have screened for food. Styela is a particularly efficient feeder, and reproduces rapidly through a long reproductive season. Each organism resembles a knobby, leathery club attached to a tough stalk and may grow to three inches or longer in length. Styela grows in dense clusters of as many as 1,500 per square yard. Cuomo and two undergraduate researchers in the marine biology program at UNH, Kathleen Sandin of West Haven, Conn. and Brunetti, have spent the past two months traveling along the northern coast of Long Island Sound looking for Styela clava. The results of this work reveal that Styela has spread as far west as Bridgeport, Conn., moving closer to the oyster farms that thrive in the Sound near Norwalk, Conn. Cuomo and her students are continuing to track the path of the species southward, as well as to study its environmental tolerances. “At present, there are few good ways to stem the progress of Styela’s invasion,” according to Cuomo. “The invertebrate does not appear to have any natural predators in the region, and any agent that might be introduced to kill the organisms en masse—such as concentrated salt or lime—could also damage the species Connecticut has worked so hard to protect,” she said. The most reliable method to eliminate Styela is to scrape any specimens free of surfaces to which they have adhered such as the hull of a ship, a technique that could provide fishermen, pleasure boaters and others with an excellent opportunity to help protect the local ecology although one has to be careful not to trigger the release of gametes (reproductive cells) when they are in the water. Some Koreans go a step further: They eat Styela steamed, in a mixture with beef, clams, vegetables and ground rice, known as mideodok-chim. Harvesting the Styela, however, would be ill advised in areas such as New Haven where there is a ban on harvesting shellfish. Styela sequesters heavy metals in their tissues and eating them from most Connecticut waters would be unhealthy. 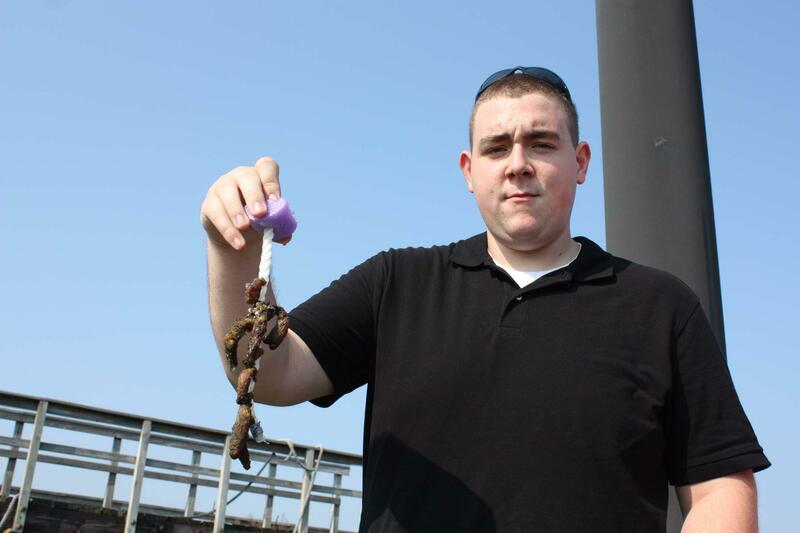 And if the threat by Styela were not enough, John Kelly, assistant professor of marine biology at UNH, and graduate student Beth Shedden of Stamford, Conn. also have identified an invasive species of shrimp in Connecticut waters. Oriental shrimp, also known as Palaemon macrodactylus, like Styela, are native to the waters off of Korea, Japan, and China. They were first detected on the east coast of the U.S. in 2001, near New York City and were recently found in the Mystic River. Kelly and Shedden have collected samples of oriental shrimp from numerous locations in Connecticut, including within the New Haven Harbor. They are trying now to determine how well established the shrimp is in the area, what habitats it prefers and whether or not it is a threat to native species.